Paw Print Genetics - Why use a cheek swab? The code to genetic health is found in DNA, which can be extracted from several sources – including skin and blood cells. At Paw Print GeneticsTM, we choose to use cells gathered from inside the cheek to check for genetic mutations in your dog’s genes. We do this for several reasons: It’s non-invasive: Unlike extracting cells from other sources, a cheek swab does not cause your dog discomfort, stress or put them at risk for infection. 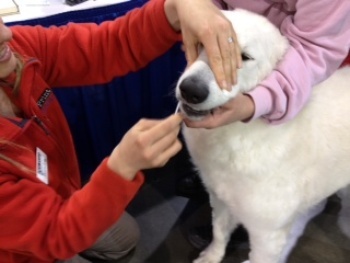 Rubbing the small sample-collection brush along the inside of a dog’s cheek to collect the cells is the least invasive and easiest method of collection for both you and your dog. No vet visit required: Cheek swabs allow you to collect a sample without leaving home, further reducing stress on your dog and making the process as simple as possible. By eliminating a visit to the veterinarian, the sample can be collected as your schedule allows, while also reducing your out-of-pocket costs. Plenty of DNA: Cheek cells also provide plenty of DNA for our geneticists to work with; DNA, the genetic material, is found in every cell collected from a cheek specimen, but not blood, as only white blood cells contain DNA. It’s easily shipped: After collecting your cheek-cell sample, you simply have to place the swabs back in their original container, drop containers into the return envelope and mail it back to our lab. That’s it. There’s no additional paperwork, approvals or special handling instructions to worry about. Unless specifically noted, every test performed by Paw Print GeneticsTM requires only a cheek swab. This convenient approach provides the most expedient and economical testing possible.